One hundred years ago a young Italian immigrated to America bringing with him little more than a great love for classical music and grand opera. It seemed only natural that his way of living would somehow include that love. John DiStefano settled in Philadelphia in 1908 and in 1918 opened his first business: a gramophone shop. Here, friends and neighbors came and enjoyed an espresso and spumoni while they listened to newly recorded operatic arias, symphonies and popular music of the day. DiStefano’s Victor dealership became a meeting place not only for the musically inclined but also a nexus for companionship and advice. His efforts to bring together artist and recording studio are well documented by the signed photographs and operatic memorabilia which literally cover the Café’s walls. The collection includes thousands of the family’s considerable collection of 78 rpm recordings, treasures of another era. Many discs are rare, out of print, or never published but still earn their keep. A larger-than-life replica of Nipper, well-known canine mascot of “His Master’s Voice” fame, stands sentinel at the front door, mute witness to a century of devotion to an ideal. As time passed, John relied on his two sons Armand and Henry for daily operation of the restaurant, and fifteen years after his death in 1954 it began operating under the sole proprietorship of Henry. Following Henry’s death in 1986, operations remained in the hands of Henry’s wife and children. In years gone by, live performances of arias and instrumental solos, with the occasional soliloquy or poetry recital, were exclusively by patrons. 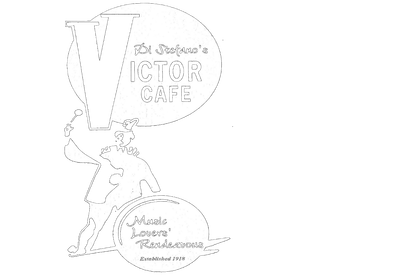 In 1979, an opera student working at The Victor Café between singing engagements sang for his customers and another tradition was born. On a shelf where a staircase connects the two brownstones which house the little café, sits a bell. Every twenty minutes or so the wait staff will take a moment between courses to ring the bell, announce a performance, and fill the café with song. 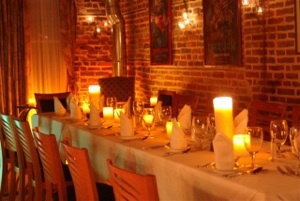 Since its establishment in 1918, Victor Café has continued to cultivate old traditions and establish new ones. This blend has resulted in the “living history” atmosphere to which our many patrons and friends return year after year.